Pourhouse is timeless. Step into the century-old building from Vancouver's historic Gastown to find a seat along the saloon-style wood and it feels like it's been there forever, even at the ripe old age of three years. Is it this feeling that makes Pourhouse so unique? Is it the lush, turn-of-the-century decor? The knowledgeable and friendly service? Perhaps the fantastic and revered bar program? The bar top itself, made from 1920's reclaimed Douglas fir and stretching thirty-eight feet, is the centre-piece of the space, with the entire backbar sitting in front of a bronze mirror meeting in the middle at a vintage boiler modified to dispense draught beer. Along with the look, the bar program focuses on the "golden age of cocktails," from Jerry Thomas to Prohibition; the techniques, drink-styles, and roles assumed by the bartenders are intended to recreate how an experience from that time might be. Refusing (politely) from the start to serve anything overly sweet, using only fresh ingredients, and never stocking any flavoured spirits or poor quality products, Pourhouse quickly established itself as both a destination for classic cocktail-lovers and those who want to learn. Perhaps what makes it truly great is its warm, personal atmosphere that is without the expected air of pretension. The staff are just as excited for you to have a beer or a glass of wine from the mostly local list as they are to craft a new and unique cocktail catered to your desired tastes. They're likewise as excited to serve the suit-ed business-lunch crowd as the short-ed passerbys. It's this welcoming and homey atmosphere overall that brings people back time and again. RW: Everyone has a different preferred title for this profession, and I find I often have to ask: what do you call yourself? RW: Where did you find your interest in classic cocktails? BG: Eighteen years ago I was bartending at a country club and I bought Gary Regan's "New Classic Cocktails" and that really inspired me. I was making amaretto sours for people there but adding egg white, and people really looked at me like I was a freak at the time. People started to come around and things really picked up and my interest grew as well. 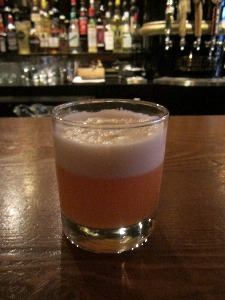 RW: What sets Pourhouse apart from other bars in Vancouver? BG: Serving cocktails that are well-researched, well-thought-out, and that we like. There are a lot of cocktails that may be "classic," but they're not that great. We really do what we love here, whether its beer, wine, cocktails, or food. Service-wise, we explain things politely to people and we have a passion for what we do. I think people see that at the bar. We really try to make everyone welcome and share our passions rather than ever talking down to people - not to say that other places are doing that. There are a lot of places you can go to get a great cocktail and a great story and great service. A few years back that wasn't the case. The long bar and the style of the space here is nice and personal as well. The bar is really the focus of the entire place no matter where you're sitting. Plus, you can come in jeans and a t-shirt or wearing a suit and you can be pretty comfy here either way. RW: Did the owners intellectualize the bar program and atmosphere beforehand? BG: Definitely. We talked about the golden age of cocktails - from the 1850's to the 1910's - and how it affected cocktail culture and what we drink today. Most of the old drinks we have now are from that age and not really afterwards. There is some stuff that Prohibition affected and that influenced us too, but we just love that particular era. As well, this area in Gastown was really booming at that time, so it made sense to put those things together. I think it was [co-owner] Nick Rossi who really came up with that - it was a lot of his ideas. He had the idea to see where things were going and do something with it. RW: Everything fits together here. There are many amazing bar programs that seem to be an afterthought to the design and intention of the place, but Pourhouse is different. BG: There was really a vision at the beginning. There was definitely an angle and everyone worked towards it. I think we're successful in a lot of ways because of that. A lot of people want Caesars and Jagerbombs, and right from the beginning we kind of put our foot down on that. We were very clear right from the start - this is what we do, and if you want those types of things there are a lot of other places you can go instead - but we always tried to do it without talking down to people. It's like being a vegetarian restaurant and putting steak on your menu because a lot of people like steak - that doesn't make sense. Do what you do well and hopefully people will come and enjoy it. RW: When someone walks into Pourhouse, what would you like them to walk away with? BG: Just a smile on their face. My favorite thing about bartending is making a drink for someone when it's the first time they've had that drink. I've made it a million times, but it's the first for them and they smile - that's a moment of truth and honesty. People can't lie - you'll know right away if someone doesn't like your drink. That moment of truth when they smile - that's what I love about my job. Doesn't matter who they are or where they're from or anything. Maybe it was just that moment or maybe five years from now they're thinking "Man, I had a drink in Vancouver this one time and it's driving me nuts!" You always remember those special experiences. I just try to share some of the love of what I do. RW: Where do you see Vancouver's cocktail culture going? BG: Things change and things become trendy, and the more people know about it the more trendy it becomes and there's usually a backlash because of that. It's definitely becoming more widespread now, and people are expecting bars that didn't do what we do to suddenly serve great drinks. Some people are even walking into chain restaurants and ordering an Old-Fashioned and the bartenders there don't know what to do. In a lot of ways, people move from one thing to another. But people were drinking Martinis and Manhattans ten or twenty or a hundred years ago. If you stay in this business for another twenty years and people are drinking out of test tubes again like in the 80's, then that's what happens. But I really think this current interest in quality food and drink will last because people are becoming more educated about what they put into their bodies. RW: Did you decide to focus on the one age of cocktail culture that survived all trends? BG: Definitely. It's like blue jeans - people wore them from the turn of the century until now. The style has changed, but they're still here. Martinis were one to one, so they've changed a lot, but they're still here. They still have an iconic status and still have a flavour that people are drawn to. Some things are trends and some things are blue jeans. RW: Do you pay attention to the trends? BG: I think I basically got lucky. The era I was interested in happened to come around with the trend - I think that happened to a lot of us. We were bartending away and making tinctures long before people were interested in it and they thought we were nuts. Now they think we're cool because it's becoming more of a part of popular culture, but at some point they'll probably think we're nuts again. The trend will come and go, but there's something great and fun in the middle of it that will never disappear completely. There may not be the number of speakeasy-style bars that have been popping up over the last five years, but there will always be a place for this type of thing and the iconic ideas that are there. As for finding new ideas, I used to scour cocktail menus from all over the world and see what people were up to. I don't really do that anymore, but it's not because I'm uninterested, I just know what we do here and I'm happy with it. RW: When you're creating an original drink, where do you start? BG: Sometimes it's an ingredient, but sometimes it's just an idea. For example, the cocktail we have on the menu right now called "The Testarossa": my grandfather was a red-head and they called him "The Red Lieutenant" during World War II - despite only being a corporal - because he escaped four times during the war, including once in Africa, and eventually made it home. That was the inspiration, and I wanted to create something with Aperol because it's an Italian aperitif, and I wanted to use gin because my grandfather was from Newcastle in England, so those elements came together and I built it from there. Everything is built on old ideas. As much as you like to think you're coming up with something new, it's probably been done. You're influenced by everyone you work with and everyone you know - I've been influenced by every book I've read and every bartender I've worked with. It's a compilation of all those experiences that makes a good bartender. And, this stuff wasn't taught to me so I could guard it against the rest of humanity, it was taught to me so I could share it with everyone I know. On that note, here is an original cocktail from Brian Grant at Pourhouse in Vancouver, "The Testarossa," featuring the house-favourite Martin Miller's gin. Combine all ingredients and dry shake, then add ice and shake again vigorously to emulsify the egg white. Strain once into a rocks glass.